Color matched for Mid-America Vinyl Shutters. Size: 3" length by 1/4"
Download installation instructions here .pdf file opens in a new window. Shutter-Lok vinyl Shutter Fasteners are sometimes called Shutter Nails, Shutter Spikes, Vinyl Spikes, Plastic Nails, Shutter Plug, Vinyl Plugs or Vinyl Nails, but Mid-America calls them "Shutter-Lok Fasteners which is a Mid-America Components brand name for their vinyl shutter screw fasteners. Of course these vinyl fasteners can be used to install any brand of shutters. If we don't have the color you are looking for you can order them as "Paintable 030", and then paint the shutter loks any color you choose. They also perfectly match the Builders Edge brand of vinyl shutters because they are exactly the same as Mid America shutter colors and are built in the same factory and use the same color names and color numbers. Builders Edge is a brand name just like Mid-America Components and the only difference is Builders Edge is, they are usually sold in the big box stores like Home Depot. 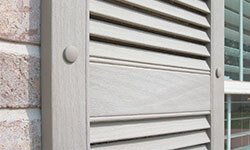 Mid-america is simply the brand name used by the independent retail outlets like Larson Shutter Company. Material: Color thru Loks are Polypropylene. Paintable option is Polystyrene. Mid-America Colors Available: 001 White, 002 Black, 004 Wedgewood Blue, 008 Clay, 009 Federal Brown, 010 Musket Brown, 018 Tuxedo Grey, 023 Wicker, 027 Burgundy Red, 028 Forest Green, 030 Paintable, 036 Classic Blue, 078 Wineberry, 117 Bright White, 122 Midnight Green, 166 Midnight Blue, 167 Bordeaux. Order came in quickly and just as advertised! I placed my order online and received the fasteners in days. At half the price of Lowe's, Home Depot, Amazon, and wherever else you might look - these Shutter Loks worked just fine!!! Excellent product to re-attach shutters that had faded and were repainted. Be sure that the original hole was drilled straight into the siding/house. Installer had angled several of the holes and while these are a quality product, they will bend if not inserted aligned with the hole. I had to order 2 extra packs due to the poor original installation. The service was fast and ordering was painless. Overall I am very pleased. Good Fasteners, great price...but be careful. Best price around on these. Color was just right. Had to re-drill the existing holes in brick mortar to create more depth for them. They hold very tightly once installed. One important tip as mentioned by others: Be sure they are lined up perfectly with the hole in the wall. They bend very easily. Fasteners matched the colors I needed and worked well on my shutters. Delivered promptly. It was easy to order, pay and to install this product. It was shipped very quickly. I ordered these fasteners after looking at the big-box stores. They wanted almost $10.00 per bag of twelve for the exact same product and in very limited colors. These matched perfectly and were 1/2 the price. Shipping was very fast and I am very happy. Good price, quality items, and fast shipping! I searched local stores and the Internet for shutter fasteners, as I was removing, cleaning and painting the shutters that had become stained/discolored. In my search, I found Larson had the color and quantity I needed and at a very competitive price. What I also saw as a benefit was the availability of using PayPal to help protect me. I ordered several bags of fasteners in the color I desired and they promptly arrived in short order. They worked flawlessly and I highly recommend this company. These were much more substantial for holding the shutter in place than the old spikes, which probably dated from 1976 and had given way to heavy balsts of wind. I was pretty amazed at the prices for shutter hardware at the box stores, especially "box" depot.com but Larson was 3/5 the price, and added only a reasonable shipping charge. Received in two days - very satisfied.